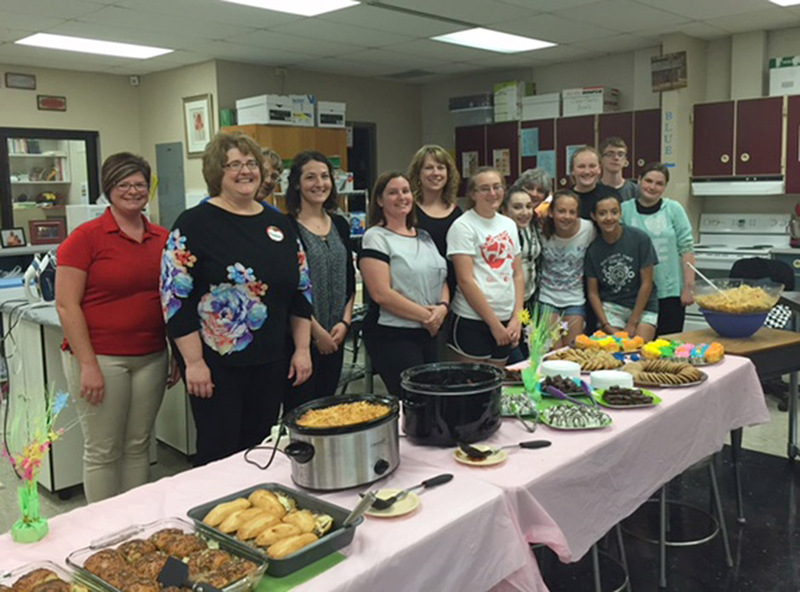 A visiting KTOY teacher team and host teacher Julie Voelz pose with the EMS Advanced FACS class, who prepared lunch for the group. Observing the instructional strategies used for English language learners in Emporia classrooms left a lasting impression on visiting teachers this week. Five members of the 2016 Kansas Teacher of the Year cadre spent the day in Emporia schools Tuesday, hosted by Emporia Middle School science teacher Julie Voelz. The five teachers – Danielle Mott of Shawnee Heights, Mary Beck of Seaman, Denham, Jeannin, and Voelz – are all district winners in the 2016 KTOY Program and now part of the Kansas Exemplary Educators Network. A sixth member of the team, Janet VanNort of Shawnee Heights, could not attend. The teachers have been visiting each other’s districts this semester, and Emporia was the final district field trip. Their day included stops at Riverside Elementary, Village Elementary and Emporia Middle School. The group also visited the Peterson Planetarium, National Teachers Hall of Fame and Memorial to Fallen Educators at Emporia State University. Another highlight of the day was having lunch at EMS, all prepared and served by the Advanced Family and Consumer Sciences (FACS) class. Students of teacher Shely Shade and aide Ginny Samples prepared a hot lunch, complete with fruit and vegetable trays, salad and a variety of desserts. 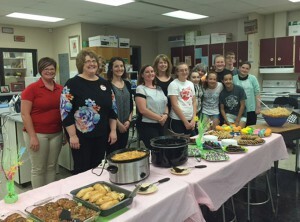 Students involved in the catering project were: Cheyenne Coe, Icela Pereira, Cameron Weeks, Megan Gordon, Payten Redeker, Daphne Poersch, Karalyn Karjala, Kaylen Hart, Metzli Rosas, Lindy Tran and Jacinda Weatherholt. All five teachers were grateful they were allowed time from their regular teaching duties to visit the other districts over the past three months. All agreed the process is inspiring and they encourage all experienced teachers to take time to visit another school or another district. “Our schools have many differences, but in the end, we are all striving for the same thing in every school,” Voelz said.